Located near the village Xaravgi . Take the road from Pylos to Kalamata or vice versa and meet Kazarma. There, follow the signs to Daybreak-Polylimnio. The gorge Polylimnio holds unique surprises for the visitor in front of him and unfolds a unique landscape of lakes and waterfalls surrounded by lush vegetation. There are 15 lakes, each one having its own “strange” name, the most typical are: Kardoyla (Heart), which took its name from its shape. The lake of Italy, Black Lake-Lake, which in earlier times was used as a swimming pool. Kadis Lake with the waterfall of 25 meters. 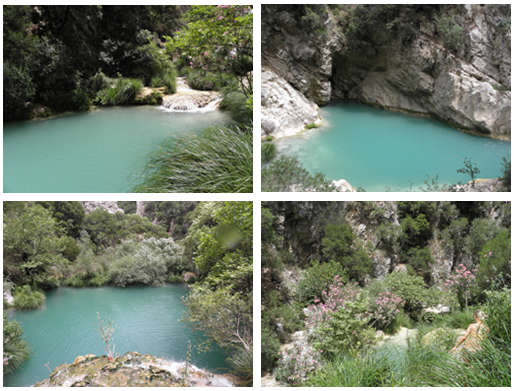 Polylimnio is a small paradise where you can swim and dive at the rushing waters of the waterfall. The scenery is spectacular that it makes you forget the 3 km hike.